I just flipped through Urban Outfitters' current catalog. I've got to say --- UO is looking really good these days. The styling, photography, and items are not only fashionable but also sophisticated. The stores may not reflect the design and taste direction of the catalog but that's why online shopping is such a welcome benefit of the internet :). I just ordered UO's own brand, Lux's "High Plains Drifter Dress" and at $48 it's definitely worth it. The dress is a mix of Alexander McQueen and Steven Alan. Love it! Wendy Nichol's jewelry collection is really quite beautiful. I picked up a pair of earrings from her recently at Shop, a little boutique on the LES. 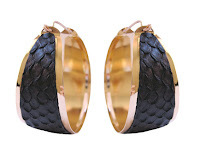 Nichol mixes gold, brass, silver, gold vermeil with authentic python and snakeskin. I'm really a big fan and think I'm going back for one her gold cuffs. I am so enamored with 3.1 Phillip Lim. His designs are amazing and I feel so good in his clothes. I swung by his Soho store last week and scooped up a couple of amazing pieces (if I do say so myself!!). One of my favorites that I wore last night to a very yummy dinner at Centro Vinoteca in the Village is the silk twill floral print dress - photo attached (you can snag it here at Net-a-Porter). I feel like Lim understands the female form and just has a world view which gets expressed in his clothing - the draping, the fine details, etc. His new spring collection hits his Soho store next week so make sure you swing by! And if you are not in NYC, 3.1 Phillip Lim is available at many online retailers like Net-a-Porter and Standard Style. Too often we wish for more hours in a day, more days in a week, more weekends in a month to get our life in order. I always find myself adding to my personal list of to-dos and wishing for some personal help. Now, I feel like I've got it after I recently came across a new site called Life Booker An incredibly brilliant idea, Life Booker is your online gateway to booking massages, waxes, manis/pedis, personal treatments on the island of Manhattan. It aggregates available slots across salons and providers who are part of the network. Case in point: I just booked a 60 min aromatherapy massage at TriBeca's Spa of Tranquility for 9pm tonight! Best part is that you accrue rewards dollars everytime you finish an appointment than can be used for future redemption. I wish everything in my life could be this easy! My favorite part of living on the LES is being able to step out and immediately find myself immersed in shopping heaven. One of my local favorites is the Pixie Market. The co-proprietors, classy and ever chic, Gaelle and Magda, have really brought some magic into the LES. Their merchandise spans a variety of independent labels including those designed and produced by the pixies themselves. Labels include Maud, Wonder Twins, Maria Bonita. Check out these amazing shoes currently in stock - Maud is Gaelle's and Magda's own shoe label produced in Portugal. Visit Pixie Market at 100 Stanton Street in NYC or 7950 W. 3rd St in L.A.